"We can show him some real Southern hospitality." - A line spoken by Alicia, played by Elle Fanning. Sofia Coppola and I have come full circle. We started with The Virgin Suicides back in the year 2000. I was in love. With her. With her star, Kirsten Dunst. With her film. With its taste in music. With its visual perfection playing like re-creations of the day-dreamt longings of my teenage years. Now, we're all back together once more (minus the pop songs, which wouldn't go here) in a re-imagining of The Beguiled, a novel first adapted for the screen in 1971 by director Don Siegel and starring Clint Eastwood in what I understand to be a much dirtier, angrier affair. I can't speak to that having not yet seen it myself, but I see what attracted her to this story. It must have been the same sort of thing that drew her to The Virgin Suicides and the story of the misunderstood young Queen of France, Marie-Antionette, though here her trapped female protagonists take what they want and keep what's theirs. In the midst of the Civil War, 1864 Virginia, a Yankee soldier, Corporal John McBurney (Colin Farrell), is found wounded, dying in the woods by a young girl, the kind-hearted Amy (Oona Laurence), out hunting mushrooms to bring back for what's left of the young ladies of the Farnsworth School. Though he's an enemy soldier, Amy decides the Christian thing is to bring him back with her as well. At the school, a gothic Southern mansion, gated and overgrown, Miss Martha (Nicole Kidman) leads her young charges, including the flirtatious Alicia (Elle Fanning) and the proper Jane (Angourie Rice), alongside Edwina (Kirsten Dunst), who wearily continues to teach the younger girls French verb conjugations and penmanship as the war is fought mere miles away. Girls left behind to present themselves to no one in a time that demands only that. 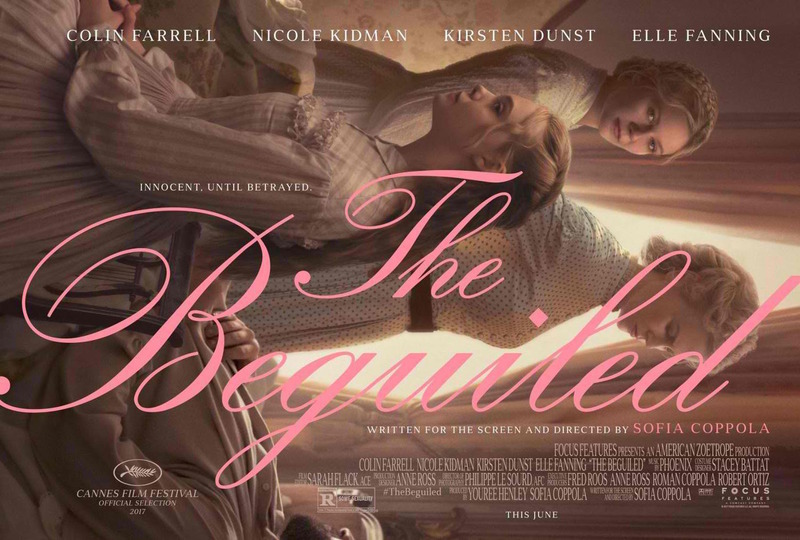 Like all of Coppola's films, The Beguiled is deliberately paced, especially early on. We are invited to watch the slow developments in the interactions of each of these women and their male captive, the ambiguously charming and undeniably handsome McBurney, each stirred by his presence in her own way. Coppola, with the French cinematographer Philippe Le Sourd, defies you to look away for a second, however, as each frame is as lovingly crafted as the one before, all under a constant haze, the humid Southern air itself another container which holds these women. Some shots here are as astounding as anything you're likely to see this year and inspiring, in a darkly comedic way, much more laughter from the audience than I would've expected. I'm thinking, in particular, of the ways in which Coppola frames her ensemble of ladies in certain shots. Dinner tables and parlor sittings are like paintings, and I particularly appreciate a brilliant shot that has all the women sitting close enough together for the different colored fabrics of their dresses to come together in a seeming pile, calling back to the same closeness of the grieving sisters thrown across the floor in The Virgin Suicides. The restrained hysteria of these women is brilliantly captured in Coppola's screenplay as well as in the minute detail of her mise en scene. For this work, she was recently honored with the coveted Best Director prize at the Cannes Film Festival, only the second woman to do so in the 70 year history of the festival. The performances are solid across the board, each actor finding a voice in the confines of such a setting. The most compelling is the complicated chemistries Farrell finds with the Kidman, Dunst, and Fanning characters, the eldest of the ladies. It's of his best work, finding notes of sympathy within the self-serving conniving inherent in his character, a man who will clearly stop at nothing to take exactly what he wants from his female caretakers. Throughout her career, Sofia Coppola has been fascinated by stories of women trapped by circumstances outside of their control with little hope for escape. She has done this three times now with the actress Kirsten Dunst, my first real celebrity crush (on someone my own age) as a teenager. I have grown up with her as an actress as I have grown up with Coppola as a director. 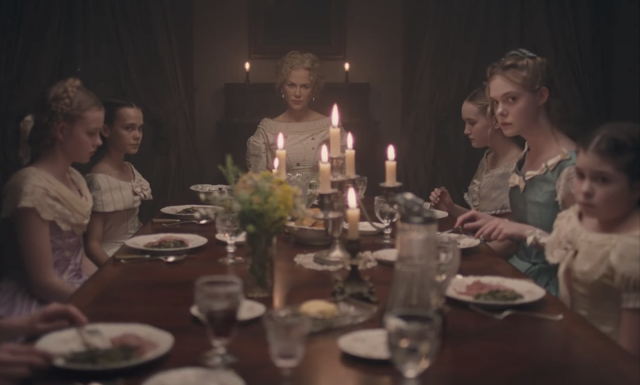 They clearly share a connection, and it is no better evidenced here, as the two of them collide with Coppola's latest muse, Elle Fanning, who together provide the dramatic backbone of The Beguiled. And that may be the main criticism I have of this film. That the twisted event that throws Dunst's longing Edwina and Fanning's bored Alicia viciously at each other isn't explored further. Alas, that might be another movie altogether but one I sort of wanted to see. Like with all of Coppola's films, a re-watch will be rewarding. 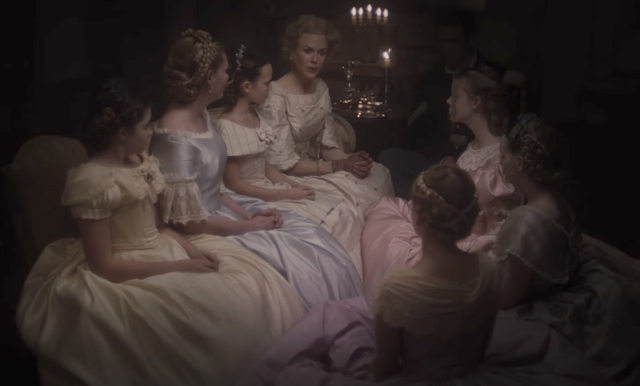 As it is, The Beguiled is everything you expect from a Sofia Coppola film from its slow pacing, which is off-putting to some, to its imagery, which can be appreciated by all, to its characterizations, the boredom of the privileged awakened by the intrusion of an alluring stranger. But this time it is packaged in a thrilling, sometimes even bloody, Southern gothic nightmare that you can't shake even if you try. Screened at Regal Downtown West 8 in Knoxville, TN, on July 1, 2017. I hear you on that criticism. Once that "walked in on" moment happened, the movie gained so much momentum in a way that was a tad off putting. On one hand, it's good that the third act flew by, but on the other, that last act didn't really match the slow pace of the rest of the film. Glad you still liked it though. It was some kind of gothic beauty. Sorry so long to reply. But, yeah, Sofia missed something there. Nevertheless, solid movie that stuck with me for days after. Gothic beauty, and gore, in spades. I agree with your complaint. I expected them to at least address it more, then that never happened. Solid film though. Right on. It certainly didn't hurt it enough to kill it for me. I cannot wait to see that one. I think Dunst is a fine actress but she never quite won me over but I read she stands out in ensemble here so maybe it finally happens. Have you gotten to it? I'm a stupid twit who can't seem to get on blogger like ever, and I have no excuse because I'm a teacher and am off for summer right now... Ugh. Dunst is great here! Really great. I LOVED her when we were younger (I'm around her age), and she has not aged very well IMO. She was so HOT back when I was in high school!! I thought this was excellent. It's an absolutely beautiful tale of sexual tension & betrayal. I'd have to watch all of Sofia Coppola's films (& rewatch Lost in Translation), but this is right up there with Lost in Translation as one of Sofia Coppola's best. My review of this will be coming up soon. Glad you dug it. The sexual tension is the truth, and I underplayed that aspect in my review.